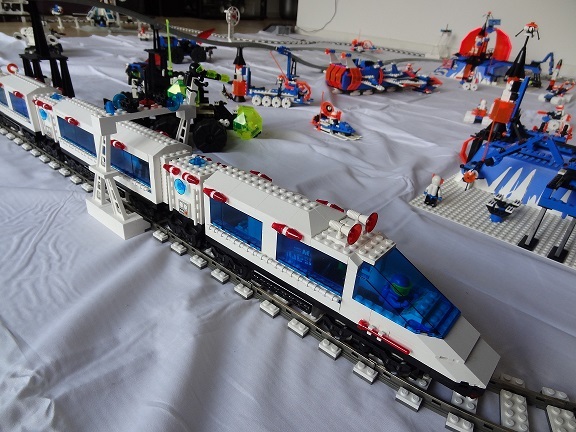 This classic space train is based on the awesome Lego 6990 Futuron monorail. I always wanted it as a kid (next to my train, I loved Lego space) but never got it. The train doors can be opened by remote control. This is achieved by a pneumatic switch that is moved by a small linear actuator and an Power Functions M motor connected to a PF IR receiver. The air pressure is delivered by a pneumatic air tank which is filled by a hand pump that is located in the first cabin of the train. One air tank can open and close the doors three times. The train is riding around in a classic space layout with, of course, also the vintage space monorail. Further more there are Blacktron II, Ice planet and Futuron classic space set for display. Welcome! On this website you’ll find background information about the projects that I’ve done in the past and and projects that I’m working on right now. Curious about how some of my projects work? You’ll probably find the answer here! Excited about my projects? Leave a tip to increase the overall project awesomeness! Please consider supporting me on Patreon!